The road to economic success for low-income working families starts with income. Families need a good and stable source of income to meet the basic family budget before they can save money or acquire assets. For most families, the source of this income comes from their jobs. Unfortunately, finding a way to Earn It, or to earn more of it, can be very difficult in rural America. Jobs may be few and far between, or they may be far away. Even when jobs are plentiful and close to home, they may be low-wage, making it hard to support a family. Or the skill training and essential services that people need to land and hold jobs – like child care or reliable transportation – can be hard to access or non-existent. Working families earn a living that allows them to survive, thrive and raise their children in their community. This means that a family’s working members can qualify for a job in the region, they can find and land that job, they can keep it, they can create their own businesses locally, their jobs produce enough income to meet at least a basic family budget, and they advance in careers and income over time. 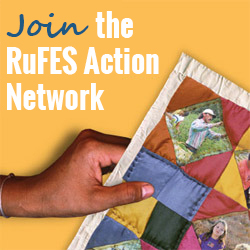 The RuFES approach includes 10 Earn It goals that, if met, contribute to sustained family economic success. Follow the links below to find common sense reasons for why a goal is important, fast facts that back up the importance of the goal, and action ideas that rural communities are using to help families plant their feet firmly on the Earn It road toward family economic success. Goal 1: Job seekers have the basic life skills—attitudes, behaviors and reliability—to succeed in jobs in their region. Goal 2: Job seekers have the basic workplace skills—communication, language, math and technology—to succeed in jobs in their region. Goal 3: Job seekers have the education or training diplomas and credentials they need to start on a career ladder in their region. Goal 4: Job seekers connect to pipelines that effectively route them to employment opportunities in their region. Goal 5: Workers have a reliable, affordable and efficient means of transport to get to their jobs. Goal 6: Workers find the reliable, convenient, affordable and appropriate child and dependent care they need to maintain a job. Goal 7: People who create full- or part-time self-employment ventures access technical and financial assistance to improve their chances of business success. Goal 8: Workers hold jobs that pay wages and offer benefits that support a stable family life. Goal 9: Workers upgrade their skills and education credentials over time. Goal 10: Workers advance along a career pathway into better jobs in the region.